Muncie Community Schools is an urban school district with approximately 6,730 students in the culturally-diverse community adjacent to Ball State University. 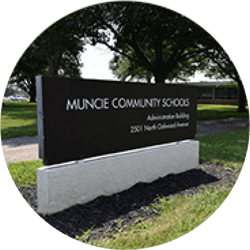 In 2014, Muncie Community Schools created an energy savings plan that identified strategies to save money without compromising the educational needs of their students. Partnering with Verde Solutions, the school system has identified innovative ways to reduce energy costs by installing six solar energy facilities: three ground mount systems at Central High School, Northside Middle School and Longfellow Elementary School and three roof mount systems at Southside Middle School, Grissom Elementary School, and South View Elementary School. To address the school system’s energy needs while paying close attention to their bottom line, Verde is uniquely positioned to structure financing where no upfront capital is need for the projects. Our Lease Purchase Agreement paired with an energy service agreement enables the school system to reap the benefits of a 30% Federal ITC solar credit and equipment depreciation that creates a lifetime lease savings of over $11 million. Financing this project brings Blox Capital significant immediate revenue as well as long term guarantees.